'Oheka', the Otto Hermann Kahn estate designed by Delano & Aldrich c. 1915 in Cold Spring Harbor. Click HERE for more on 'Oheka' and HERE to see the brochure from when the estate was for sale. Photo from American Country Homes of Today, 1928. Zach - Any chance that you can get a hold of the original floor plans of OHEKA? I noticed that the website has one, but it appears changed given it's new life as a wedding venue. I'm also curious how the indoor pool was situated? I'm assuming it was technically on the basement level, accessed via a passage under the courtyard. The perfect Gatsby spread indeed. The extensive formal gardens were wonderful. The quintessential Long Island Gilded Age estate. "I'm also curious how the indoor pool was situated?" I found this slide labeled "Indoor Pool" under the Restoration Photos slideshow on the Oheka website. If this attempt to link you there fails, go to the site. Was the PreViews brochure created before it was acquired by the sanitation department? Aside, props to Gary for the link to The Great Gatsby (1949) movie ... I enjoyed watching it last night. Reverting back to yesterday's topic, I do wish there had been more of a Merchant & Ivory attempt to visually capture the Gatsby era as they did so well with 'Remains of The Day' and its pre-WWII era . 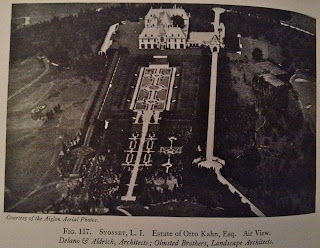 Anybody else recall that an aerial image of Oheka was used to depict "Xanadu" during the opening sequence of Citizen Kane? Perfect Gatsby, indeed -- even with limited bygone technology, I wonder why it never occur to any producer/director to use it? More pointedly, is it just possible that such an American classic simply cannot be translated well to the screen? Each time I read The Great Gatsby, I envision something just a little different, and never quite what I've seen onscreen. also had a house in Palm Beach with same name. The Palm Beach Kahn house featured on the right.